Starting an Internet business is the way to financial freedom and great success in your life, and you need help to get there quickly. That’s why I started this online marketing tips podcast for my community. Is there a way to increase our SEO (search engine optimization) for each of our blog posts? Are you using private label rights content (PLR) in your online marketing? Does article marketing still work as a way to drive targeted traffic and build my list? 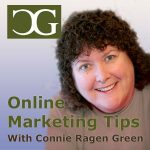 In this episode of the Online Marketing Tips Podcast With Connie Ragen Green, my newest podcast series, I discuss these questions and more. We also discuss the most effective strategies for writing and marketing your content for Kindle. During this call we also discuss Black Friday events on the Internet and which ones are the best ones for you to attend and pay attention to as you build your own online business. I also address the idea of writing down your plans and goals for the coming year. I’ve been goal setting since 2005 in this way and it has made a huge difference in my personal life and in my business. All of my open calls are interactive so that your voice may be heard. During this call I am joined my many of my students and subscribers who share their questions, concerns, and accomplishments with their online business in regards to content creation, list building, social media marketing, and more. This time we discussed using article marketing effectively to promote yourself and your online business, creating an irresistible free giveaway, PLR (private label rights) and content creation, how to know when the time is right for you to set up an autoresponder sequence, tips on getting more Facebook fans, pricing a new information product, using royalty free music for your podcast and other websites, Jason Fladlien’s Measure My SEO plugin, and much more. This podcast and these online marketing tips are intended to teach you how you can take your business to the next level quickly and effectively, and as a way for me to share my very Case Studies, secrets, and advice on creating a profitable and lucrative online business using the ‘multiple income streams’ approach. Each session is first recorded live as a teleseminar, and then repurposed into a podcast to extend my reach to the world. Please join my list to be included on these calls, and be sure to introduce yourself and share your site for optimal exposure for years to come! Also, you can now pick up my popular training on winning affiliate contests and other online marketing tips for only seven dollars at Affiliate Contest Secrets. Use the discount code CONTEST to bring the price down to $7. This training has been updated for 2013 with the latest information, strategies, and Case Studies for you to use in your own business.